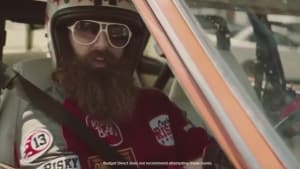 Captain Risky is once again showing why Budget Direct won't insure him. This time with Skippy the kangaroo. Captain Risky is at the mercy of an inquisitive kangaroo in the latest ad for insurance company, Budget Direct. The infamous brand mascot finds himself in a sticky situation after an incident with a tree. Much like a Budget Direct customer - however we all know that Budget Direct won't insure Captain Risky. The ad, by 303MullenLowe Sydney, rolls out across television, digital and social channels.